Sushmita Sen, socialite Queenie Dhody and Lara Dutta pose for shutterbugs during the launch of Giantti jewellery. Among the other guests spotted at the jewellery launch was the newly-married Eesha Koppikar, looking very radiant. Castrol brand ambassador John Abraham and footballer Baichung Bhutia unveiled Castrol's promotional campaign to kickstart the World Cup fever, in Mumbai on Wednesday. John is all set to go to the forthcoming 2010 FIFA World Cup in South Africa. 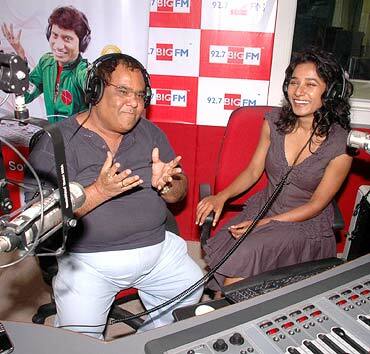 Actors Satish Kaushik and Tannishtha Chatterjee promote their movie Road, Movie at Big FM studios in Mumbai on Wednesday. The movie, which releases this Friday, is directed by Dev Benegal, and also stars Abhay Deol. 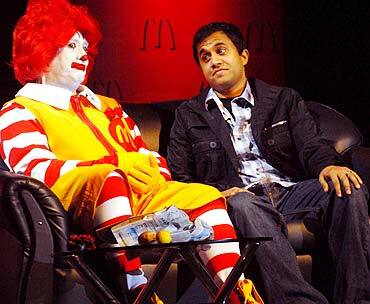 A man dressed as Ronald McDonald -- McDonald's mascot -- poses with Omi Vaidya (who shot to fame after his role of 'Chatur' in 3 Idiots) at the launch of the food-chain's happy price menu in Mumbai. Celeb style: Saris, skirts or swimsuits? Vote! Pix: Ash plays Holi in style!